The flavors of a bratwurst, grilled and served like a burger. 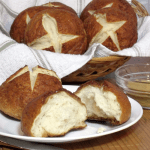 If you haven’t had this Wisconsin classic, you need to! No state tailgates like Wisconsin tailgates. I know that’s a bold statement. But, I’m confident it’s true. When hoards of people show up in the early morning before a late afternoon game to set up camp in a foot (or more) of snow: that’s tailgating dedication. When you think of Wisconsin, you tend to think of beer, but I’ll tell you a secret: I’ve seen my share of wine bottles un-corked at a Wisconsin tailgate too. And, with Gallo Family Vineyard‘s mini bottles, you don’t even have to worry about remembering the corkscrew. Enjoying some wine with your tailgating fare becomes just as easy as cracking open a beer. And, really, who wants an ice cold beer when the outside temperatures are flirting with freezing? Wouldn’t you rather have a full bodied red wine to warm you down to your toes? When it comes to tailgating in Wisconsin, it’s all about the meat: burgers, brats, chili. We’re talking food that sticks to your ribs and sustains you for a long, enthusiastic game. If you’re enjoying the game at home, some people like to break out a spread of hearty finger foods that can be munched on throughout the game. But, true Wisconsin tailgating happens outdoors, in the parking lots and fields surrounding the stadium. And, once football season really gets going, you’re lucky if you’re tailgating above 60ºF. As Tim puts it: you can’t eat finger food with gloves on. What Is A Brat Burger? Bratwurst is probably the most quintessential Wisconsin tailgating food, but brats don’t stop at the traditional grilled sausage. Some people love the brat flavor, but would rather have their meat in patty form. That’s where the brat burger comes in. 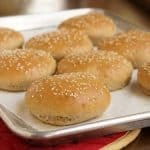 It’s easy to make your own brat burgers. Ground pork replaces ground beef as the base for the patty. (If you don’t have a meat grinder, ask your butcher to grind a pork shoulder for you.) 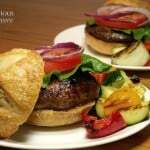 The pork is then seasoned with classic bratwurst seasonings, which infuse the patty with all of that glorious brat flavor. Just like in a classic brat, sauerkraut and mustard are the only toppings you need. (But, if sauerkraut isn’t really your thing, these are just as tasty with ketchup or un-adorned.) And, if you’re really feeling like channeling your inner Wisconsinite, you’ll put your brat burger on a salty and chewy pretzel bun. If you love a good brat, you’ll be head over heels for this burger version. 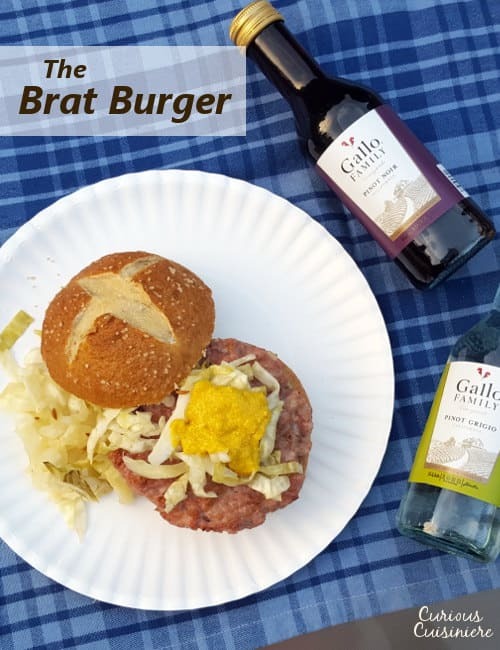 We paired our brat burger with Gallo Family Vineyards Pinot Noir and Pinot Grigio. The Pinot Noir has a deep juiciness that pairs wonderfully with the brat spices and smoky grill flavors. 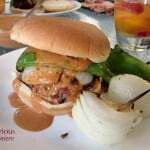 The Pinot Grigio is a perfect, light wine for sipping as you hang out with fellow fans, and its brightness brings a nice balance to the pork and chewy pretzel bun. 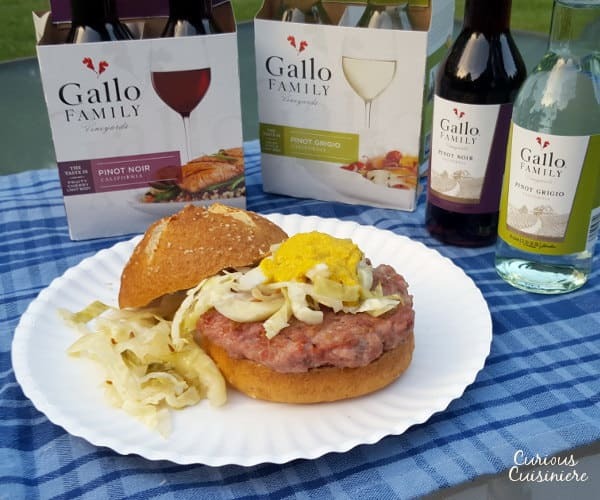 For more tailgating recipes to pair with your favorite Gallo Family Vineyards wines, take a look at their Tailgating Season blog feature and the tasty dishes from the Sunday Supper family below. Be sure to find out where to pick up some mini-bottles of your favorite Gallo Family Vineyards wines for your next tailgate by heading over to their Store Locator. And, you can stay up to date on all the Gallo Family Vineyard wine news through their social media outlets: Facebook, Twitter, Instagram, and YouTube. For best flavor, let the seasoned pork rest for at least 3 hours before shaping your burgers. In a large bowl, mix together meat and seasonings. Let the meat mixture rest for 3 hours, up to overnight. 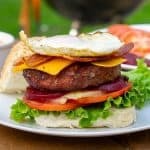 Grill the burgers for roughly 4 minutes per side, until they are firm and cooked through. 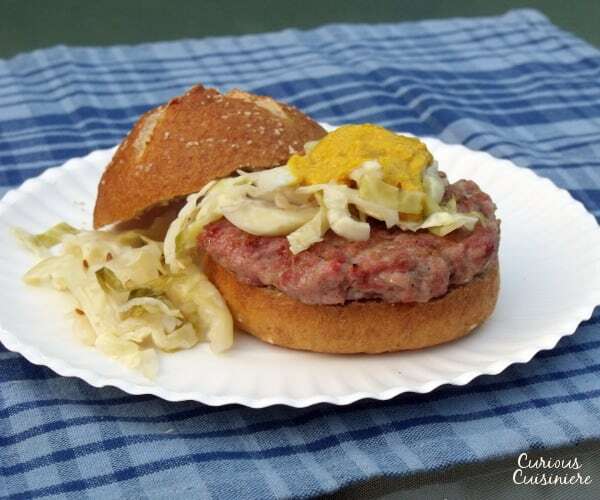 Serve the brat burgers on a bun with sauerkraut and mustard, if that’s your thing. If not, they’re just as good with ketchup, or any other burger topping for that matter. 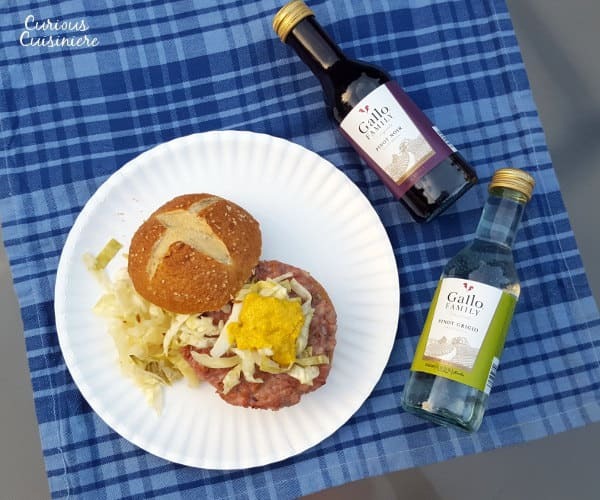 For more great tailgating inspiration and wonderful Gallo Family Vineyards wine pairings for tailgate season, check out the recipes from the other Sunday Supper members below. Oh yes please, this looks fantastic! 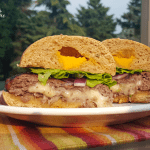 What a fun change from the traditional burger! Yum! Who wouldn’t love a good Brat! Let’s rename this the Brat-er! I’ll go to any home tailgating party you throw!